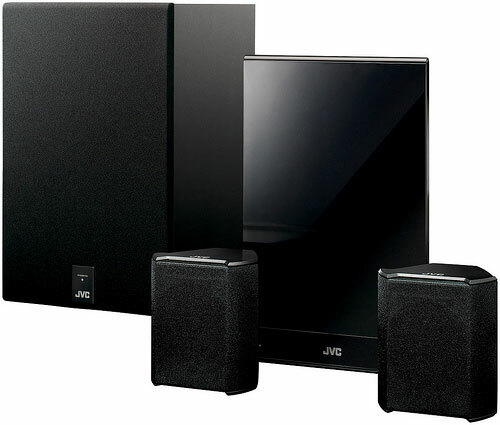 JVC over the last few months has released a range of wireless sound bar home theatre systems. The first set I came across were the TH-BA3 and TH-BS7. JVC said “These are the world’s first dual wireless soundbar system that features a wireless subwoofer and wireless surround speakers”. The second set were the TH-BA1 and TH-SB100 Like the TH-BA3 and TH-BS7 these offer the same low-profile front surround sound bar and wireless subwoofer, sleek design, wireless surround sound, and JVC’s front surround technology that provides a surround sound effect without the need for rear speakers. All systems come with built-in Dolby Digital, Dolby Pro Logic II and DTS decoding. With a single cable you can connect the sound bar to your DVD/Blu-ray player, TV. Except for the TH-SB100 it comes with a separate JVC XV-BP1 Blu-ray player. The TH-BA1 and TH-SB100 offers two digital optical inputs and one analog input. The TH-BA3 has one analog, two digital input while the TH-BS7 has three optical and one analog input. The TH_BA3, TH-BS7 and TH-SB100 are all 4.1 channel while the TH-BA1 is 5.1 channel with 280 watt. The systems are designed to complements some of the slimmest flat panel HDTVs.